One of the things we wanted to do on our second trip to San Francisco in 12 months was to get dinner reservations at a certain restaurant. When we were in the Bay Area last year after New Year’s we tried to get reservations to this particular restaurant, but they happened to have a few days there where they were closed and therefore getting in was not possible since they weren’t even open for business. So, as soon as we booked these plane tickets, the first thing we did was check the calendar to see if the restaurant would be open and how we could get a table. Turns out, the restaurant was open, but reservations were only taken a certain number of days in advance and reservations opened at midnight or something weird like that. By the time we remembered that we needed to check online for reservations the restaurant was down to one table left at 10:15 pm, so even though it was late, we took it before the opportunity to dine at this restaurant passed us by again. 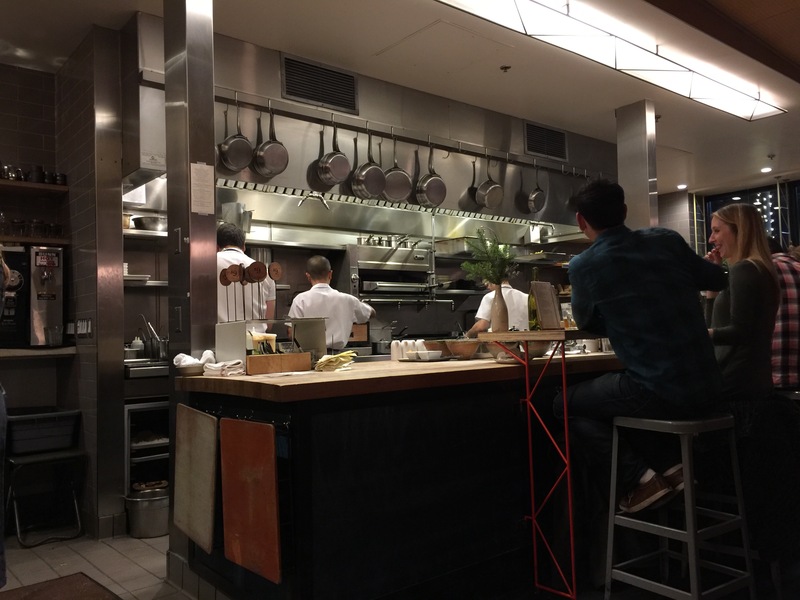 State Bird Provisions, a one-Michelin star restaurant and winner of the James Beard award for Best New Restaurant in 2013 and Best Chef: West in 2015, is probably best described as American fare served dim sum-style. In 1931, the official state bird of California was designated as the quail. The proprietors of State Bird Provisions say that their restaurant started out more as a recipe for quail and kind of grew from there to what it is now, an ever-changing menu with very few, if any, set items, created and produced based upon seasonal ingredients and tastes. According to the dictionary, the noun provision is “the action of providing or supplying something for use,” in this case, food and drink. So the restaurant, State Bird Provisions was born. This restaurant, with a small, open kitchen is non-stop action as it churns out plate, after plate, of small dishes using fresh seasonal ingredients to create a multitude of California-inspired, American fare. From one moment to the next, you can’t predict what will come out of the kitchen as you watch the chefs work diligently with the tools of their trade. The restaurant serves food in two ways, first, there’s a small menu that you are provided with when you are sat at a table or at the kitchen bar. From this menu, you can order as much, or as little, as you choose. These dishes will be prepared for you once they’ve been ordered, and brought to your table as they are completed. However, don’t fill up on the menu items because, as described, this restaurant also serves food dim sum style. Instead of steamed bamboo baskets or metal trays that you’d expect to see in a Chinese restaurant, here, beautiful small dishes are created then lined up on hand held serving trays, or push carts, and then servers go around to each table, describe the dish that they are presenting (that you can’t find on the menu), let you know what the price is, and then you make the decision as to whether or not you want to try these small little morsels. There’s no pressure, so if they present something you’re not interested in, you just move on. However, if you are interested in the dish, you let the server know how many you want (1 serving, 2 servings or more), the dish(es) is taken off the tray/cart ands served at your table family style for everyone to share. Then, much like a dim sum restaurant, the server marks the card at your table indicating how many servings you ordered and at what price. At the end of the night, when you’re all done, the card at your table is taken away, whatever you may have ordered off the menu and from the dim sum-style serving is added up, and you’re presented with your check. I’ve never seen American cuisine, or really another other than Chinese cuisine, served dim sum-style, and that is part of the appeal of State Bird Provisions, not to mention that the food served is fresh, creative, and delicious, but the atmosphere and concept of food service is fun, inviting, and participatory. 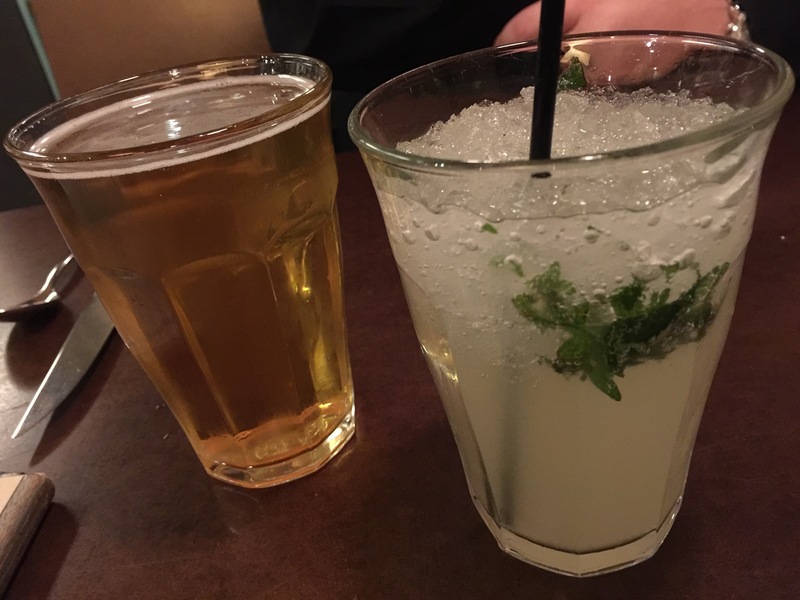 Before we got the evening started with food, we decided to order a couple of drinks. State Bird has sherry, sparkling wine, champagne, ciders and beers available. My husband went with the DIPA, Honey Badger, Marin/Cellarmaker Collaboration, local to Larkspur, California on draught. I went with a non-alcoholic sbp soda in the flavor of Shiso Yuzu, pretty much a fancy homemade lemonade soda. We started the night by reviewing the menu on the table. We chose a couple of items from the menu that we both wanted to try and then we waited for the dim sum carts and trays to come around to see what else tickled our fancy. 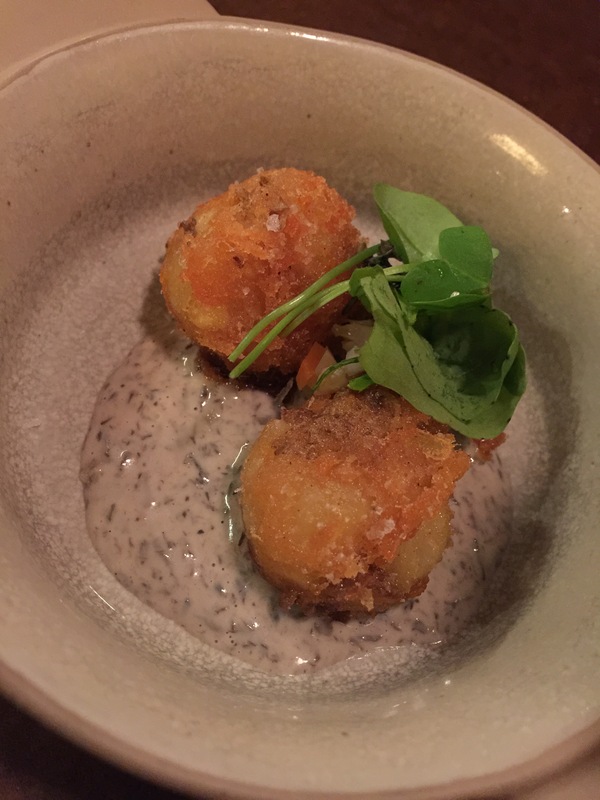 The first dish we chose from the first dim sum tray that came around was potato-trout croquettes with black trumpet ranch. The potato-trout croquettes were definitely tasty. They were perfectly fried so that they were super crunchy and crisp on the outside and tender and warm on the inside. The texture of the potato-trout combination was interesting. I’ve had potato and ham croquettes before, but mashing together potatoes and white fish meat seemed such an interesting combination that actually worked really well for me. Both the potato and the trout was left chunky enough to be identifiable as separate ingredients and the fish was light and flaky and the potato was dense and fluffy. As for the black trumpet ranch dipping sauce, I didn’t really taste any of it other than what was on the bottom of the croquette that I picked up. Unfortunately, I’m not a fan of ranch dressing as a dressing or dipping sauce, and adding black trumpet mushrooms for someone who isn’t a mushroom fan isn’t an “add” for me. The next dish was also a dish passed around dim sum-style, the crispy and crunchy pork with apple mostarda. A mostarda is a Northern Italian preparation of candied fruit in a mustard-flavored soup, traditional served alongside boiled meat. In this case, the apple, glazed or preserved in a mustard-flavored syrup was served mixed with crispy and crunchy pork. Apple and pork has always been a classic preparation, and these flavors played upon that pairing of sweet apple with rich and fatty pork. The acidity and sweetness of the apple help to cut through the pork, and by making it a mostarda, the apple is treated with the added element of the mustard-flavored syrup with adds a little acidity and a little bit of background heat to the dish. 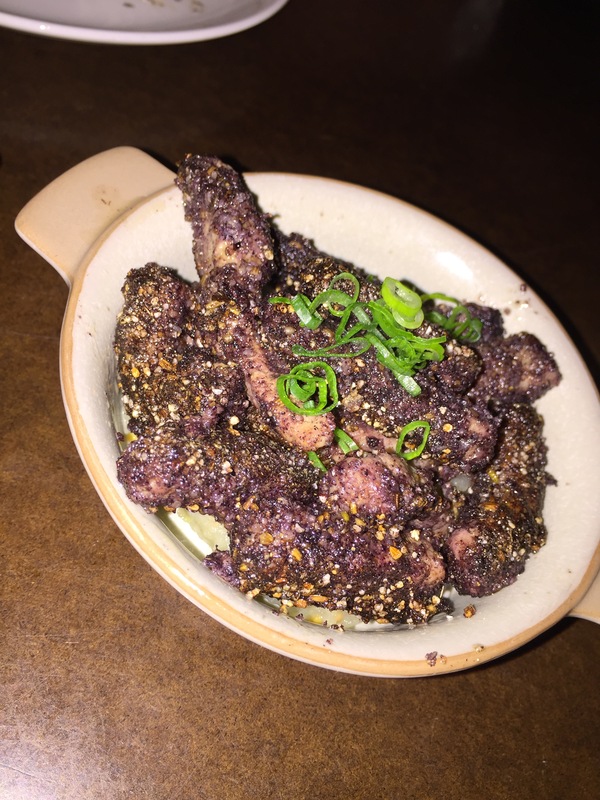 The crispy and crunchy pork is as described with the pieces of pork cut up perfectly into bite-sized pieces of deliciousness that were a bit crispy and a bit crunchy at the same time due to a coating that is on the outside of the pork. The combination of fatty meat and acidic and sweet apple is a good pairing and makes a nice little dish that is a great size to share between two people. As more dishes were pushed around and passed by our table, we couldn’t resist trying each dish. Our original idea of ordering a bunch of items off the menu slowly started to dwindle down as we kept ordering dishes from those being passed around. Our next dish that we decided to try was the smoked trout with wild rice and mushroom in a pork belly dashi. For me, this was one of my favorite dishes of the night. The small morsel of smoked trout clumped with the wild rice in a loose dumpling sitting in the middle of the bowl was delicious. 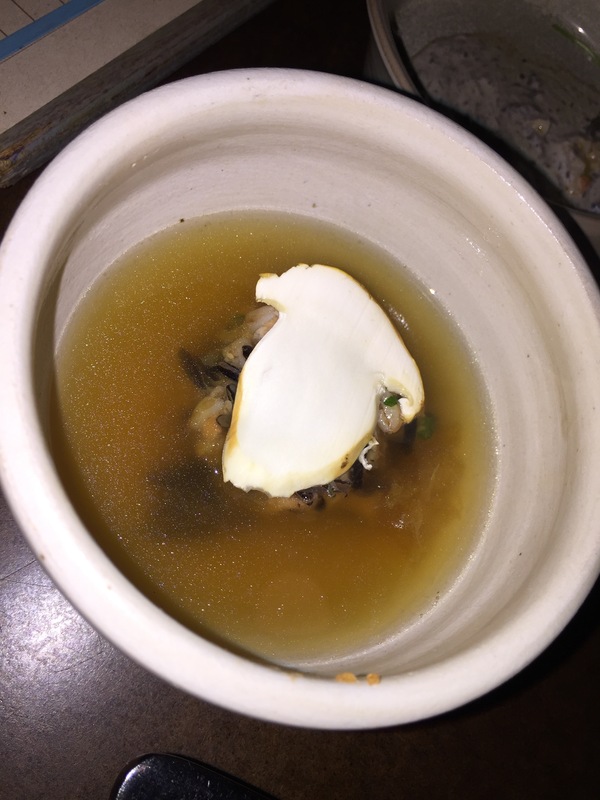 A paper-thin slice of mushroom was laid atop of the “dumpling” and then the pork belly dashi was poured into the bowl. The pork belly dashi was rich and warm and just so inviting. The flavors were complex and just so delicious and using the pork belly for the fat to help flavor the dashi was creative. The wild rice and smoked trout was strong and rich with its own flavors that actually paired with the dashi really well. This was a small little bowl, more like a cup of this soup. Based on how good it was, I could have used a whole bowl of these little smoked trout and wild rice “dumplings” and this amazing pork belly dashi broth. Another dish passed around that I had heard of before being quite popular was the garlic bread with burrata cheese. I told my husband we had to try one of these garlic breads. I like garlic bread, my husband is a fan of cheese so its like the perfect combination. However, I also feel like this was one of those dishes that had so much potential and then just fell a little short. First off, I thought that the garlic bread was a bit too chewy and not crunchy and crispy as I had expected. This could be because it wasn’t garlic bread fresh out of the oven, so when it’s allowed to sit for a while, it cools down and just gets a bit chewier in texture than I had expected it to be. Also, the bread, although described as garlic bread, seemed to be lacking a bit in the garlic part of the bread. I had trouble identifying any sort of garlic flavor in the bread. The bread is topped with a good amount of burrata cheese that had a great fresh texture and quality to it. It was so and creamy and delicious. Very mild in flavor, there is a nice amount of black pepper sprinkled atop the burrata to add just that tinge of spice and flavor to the dish. You’re supposed to grab a chunk of the bread and some of the cheese with the black pepper and eat it all together to get the flavor of all the components. If the bread had been crispier and crunchy and flaky, with a good garlic flavor, it would have been such a great flavor combination with the cool and creamy burrata cheese and the black pepper seasoning. 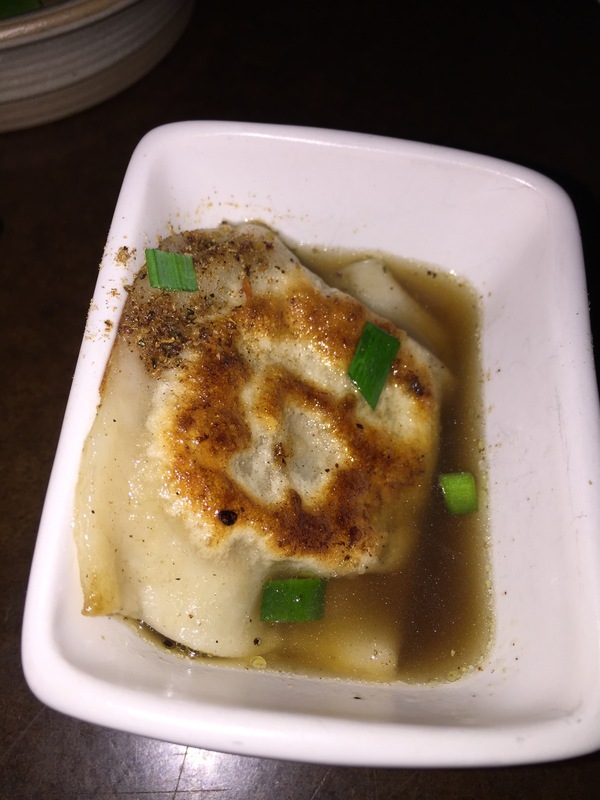 My husband decided that he needed to try one of the restaurant’s more popular and signature dishes, the guinea hen dumpling with aromatic broth. Again, this was another dish being passed around dim sum-style. That made 5 dim sum dishes so far that we’d ordered from the passed trays and pushed carts. This was definitely a dish for one person to enjoy as it contained on guinea hen dumpling and just a little bit of broth. The dumpling was nicely pan friend and had a great crispy quality to add crunch and texture contrast. The guinea hen filling was hearty and rich and my husband thought it was delicious. But, the star of this dish for him was the broth that the dumpling was served with. It was rich and hearty and full of flavor and my husband wanted more than just the little bit of broth they gave him. I imagine, it was just as good as the pork belly dashi served with the smoked trout and wild rice dish we ordered. Crispy pork belly with citrus salad and vinaigrette was the next passed dish to come out of the kitchen. I think by this time, we had only refused one or two of the dim sum-style dishes being offered. We had better slow down if we wanted to order anything off the menu at all. My husband wasn’t interested in this dish at all, so this was all mine. Of course, I had to take off the slices of jalapeño because I’m weak and it’s too spicy for me. However, the crispy pork belly was fantastic! It was tender and flavorful. The pork belly was pan grilled so it was crispy on the outside and fork tender on the inside. The greens provided a nice flavor contrast to the rich and fatty pork belly and the vinaigrette added a nice acidic tang to the fatty pork belly as well. However, the star was the citrus segments which added the perfect counterpunch of flavor and texture to the pork belly and really brought the whole dish together. 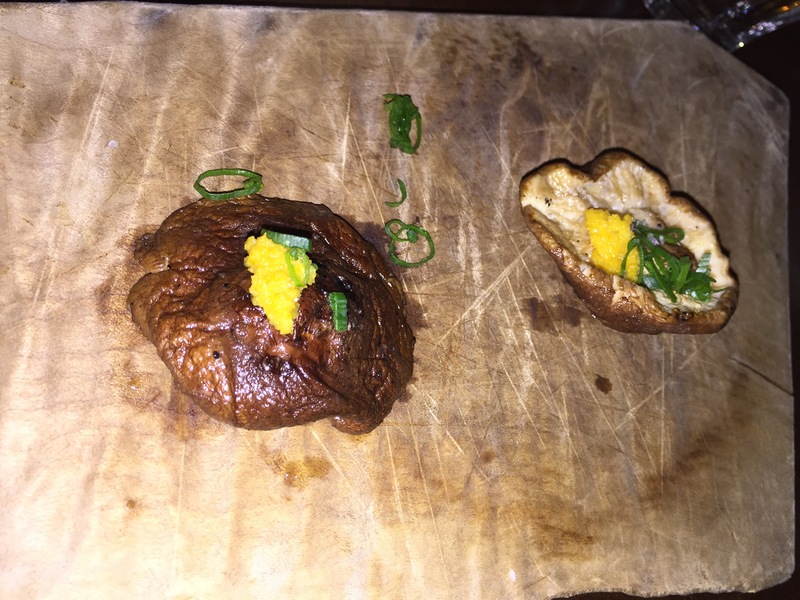 The next dish was totally for my husband, he decided to try and order of the grilled shiitake mushroom with meyer lemon kosho. Kosho is a Japanese seasoning that’s fermented, this time it’s made with meyer lemon. Essentially, it’ll just intensify the flavor of the meyer lemon. The grilled shiitake mushrooms were beautiful and hearty. Two mushrooms per order, my husband loved it from the first bite. The grill/char flavor of the shiitake was warm and inviting, and the meyer lemon kosho. This dish was much heartier than it would appear to be. And even though I don’t like mushrooms, after my husband had a bite of one of the shiitake’s he told me that I had to give this a try because if you didn’t know it was a mushroom you’d never guess. Generally, my husband doesn’t lead me astray when he asks me to try a food item, so I allowed him to cut me off a small piece so I could try it. Surprisingly, he was right. The flavor of the meyer lemon kosho and the meatiness of the shiitake along with the wonderful grill flavor really made this taste like something other than a mushroom. While it had a woodsy, earthy taste, if I didn’t know it was a shiitake, I’m not sure I’d guess that I was eating a mushroom. It was a pleasant surprise. For me, the next dish was the one dish of the evening that I really did not like. And that’s quite unfortunate since I’m the one that chose to get an order of this dish off of one of the passed trays. 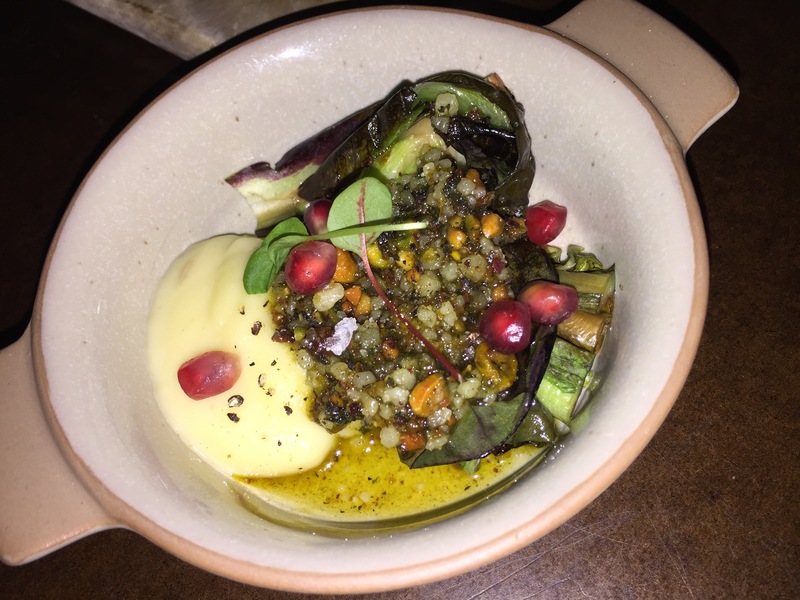 This dish was grilled chicory with pomegranate seeds over potato puree. the dish looked pleasant and light like a salad. The potato puree was the best part of the dish, it was smooth and rich and flavorful and exactly as described, a potato puree. The pomegranate seeds were also tasty, but then again, they were just pomegranate seeds straight out of the fruit. It was the chicory that really turned me off of this dish. I’m not sure how chicory is supposed to taste normally on its own, but in this dish, the grilling of this plant just brought out such a heavily bitter and acidic taste to the greens that it was so overpowering and off-putting and generally inedible that I couldn’t stand more than a couple of bites of the dish. My husband also tried it and didn’t like the strong bitter flavor coming off the greens that he didn’t want any more of the dish at all. In my book, this dish was definitely less than desirable and a complete failure in flavors. Finally, the first item we ordered from the menu arrived, the “croque madame” ham & fiscalini cheddar whole-grain pancake. 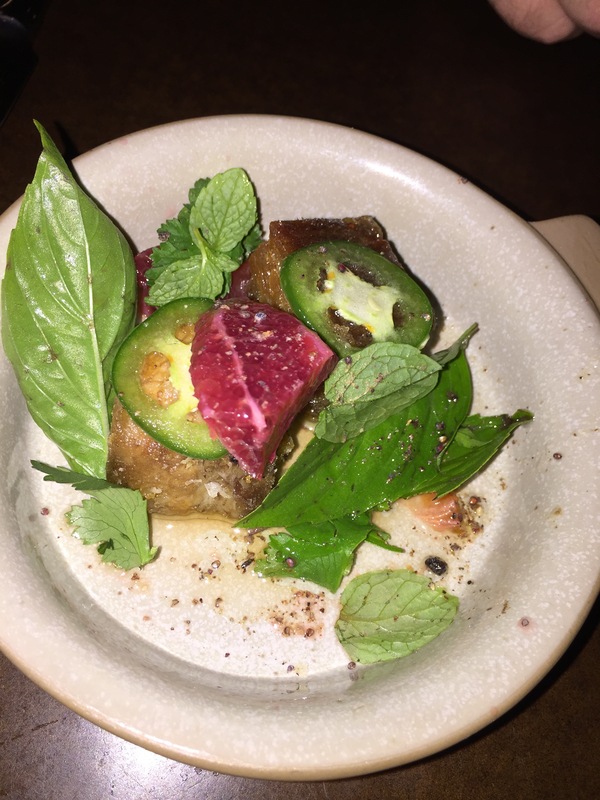 This was off the section of the menu called “toasts & pancakes” where State Bird Provisions has small bites that they offer that are packed with flavor. Each order of a toast or pancake was meant to be a single serving for one person, so you needed to order accordingly based upon how many people wanted a taste of each toast or pancake ordered. This particular “croque madame” order was placed by my husband. 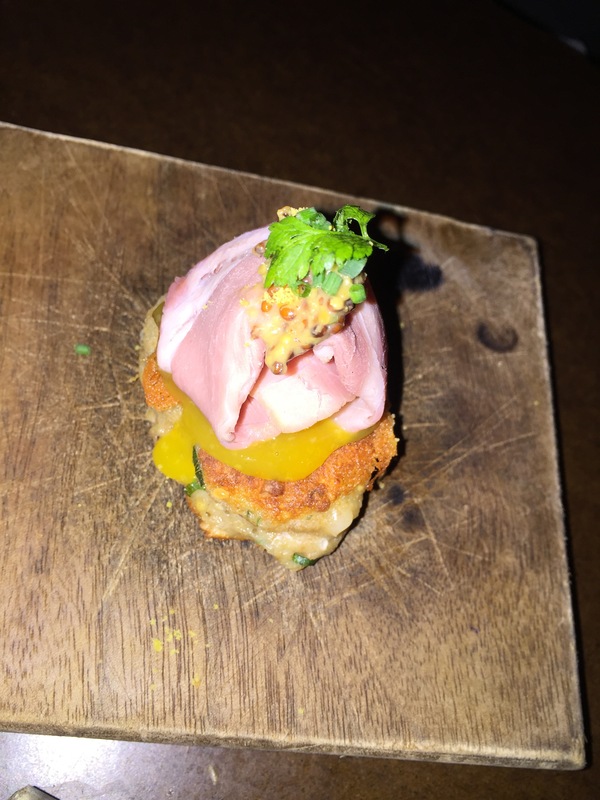 Essentially, this was a fancy, high-end ham and cheese “pancake,” which is right up my husband’s alley. Of course, my husband was going to love this. It’s got ham and it’s got cheese, what is there not to like. The whole grain pancake was an interesting “bread” substitute which actually made this small little pancake a lot heartier than it appeared to be. The cheddar was delicious and the ham was salty, but the bite of the whole grain mustard atop the pancake was a nice flavor punch to this dish that brought the dish together. The second item I ordered from the menu arrived at the same time, it was the yogurt butter-yellowtail “floss” toast. This was my selection from the toasts & pancakes menu. 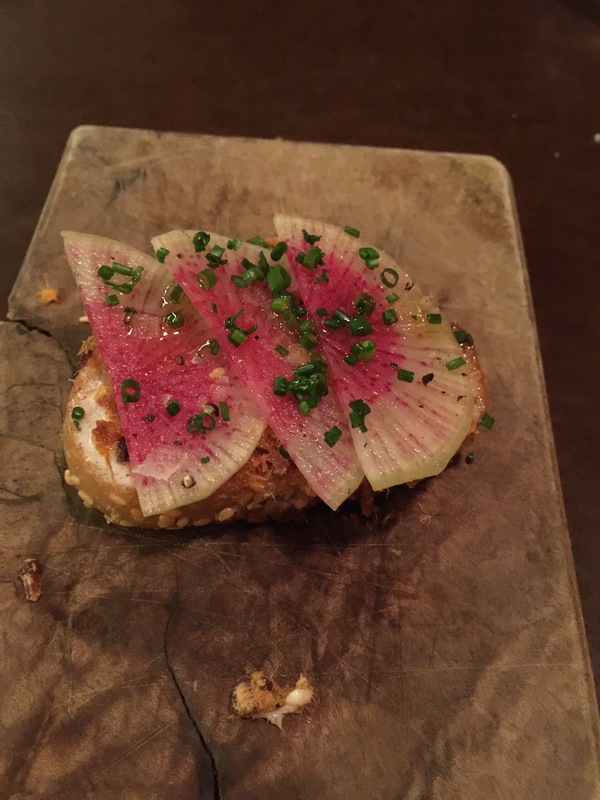 I loved the watermelon radish that topped the toast. The yellowtail was light and delicious, but my favorite part of this was the toast itself which was some sort of sesame toast. It was perfectly toasted and crunchy and hearty. Sliced thin enough that it wasn’t too chewy, but had enough weight to be a pretty significant couple of bites. The flavor of the fish and the sesames and the watermelon radish all came together into an enjoyable few bites. We were pretty full by now, but when one more cart was pushed towards our table and they were offering steak tartare, I just couldn’t refuse. 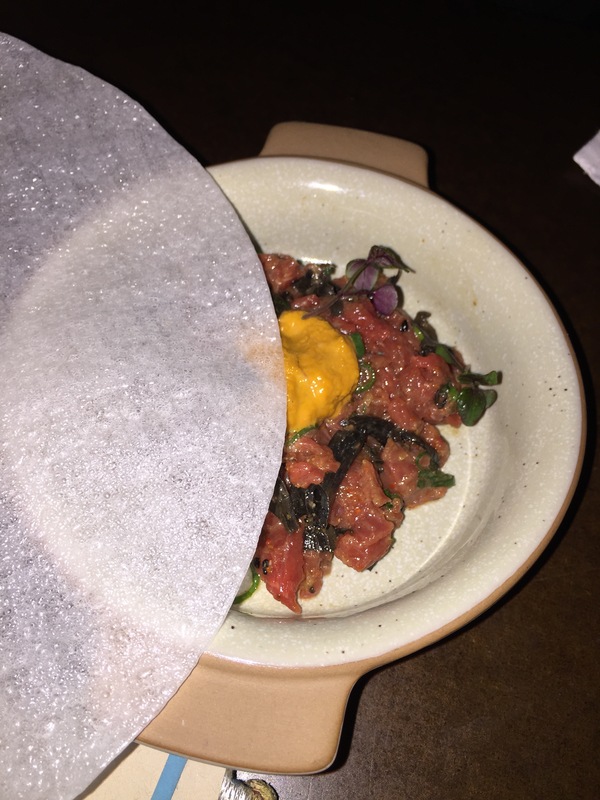 Steak tartare with umeboshi-rosemary vinaigrette and a surprise of uni served atop the tartare and crispy rice paper. I’d never had uni before, so this was going to be interesting. The steak tartare was strong and potent from the umeboshi-rosemary vinaigrette. Umeboshi is a pickled Japanese plum, and the flavor of the umeboshi was really prevalent in the steak tartare. The steak itself was rich and tender. If you didn’t know it was raw beef, you’d never know from just tasting the dish blindly. However, I thought that the umeboshi-rosemary vinaigrette was just a little too strong and it overpowered the rich flavor of the steak rather than complimenting it. The uni, was rich and strong and gave such a distinctive flavor to the steak tartare. The jury is still out for me as to whether or not I liked the uni or not. It seemed a bit gratuitous. The idea of using the rice paper rather than bread, or chips or something else was interesting and fun, but there wasn’t nearly enough of it. In the end, while the taste of the dish was powerful and packed a punch, I couldn’t get through the entire dish as the flavors were just a little too strong for my palate and not really what I was expecting from steak tartare. It’s amazing how small bites can get you so full. Every time a cart was pushed by or a tray presented at the table, it seemed like we wanted to try one of everything. And yet, as our table was filled up, we realized that we were starting to get full. So many flavors, so many ingredients. But, of course, as the night drew to a close, we couldn’t leave without trying some dessert. After looking over the dessert menu, my husband and I each decided to get our own dessert. 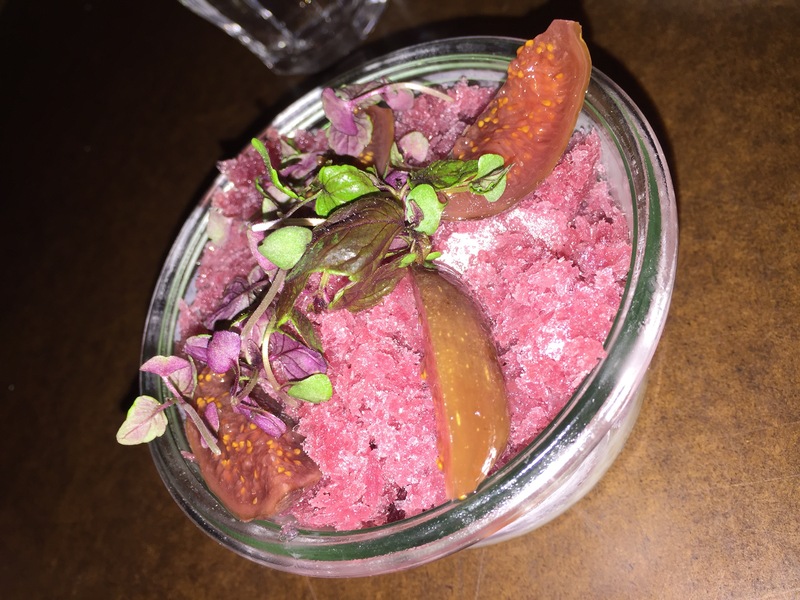 My husband chose the mulled wine granita with vanilla tapioca and orange blossom-poached fig. The dessert was this beautiful, rich magenta granita in a glass jar which sat atop a beautiful layer of vanilla tapioca. Over the top of the mulled wine granita were a couple of slices of poached fig and some micro greens as well for some added flavor and crunch. My husband really enjoyed the contrast between the cool and boozy mulled wine granita with its icy texture and the sweet vanilla tapioca layered at the bottom of the glass cup. The texture contrast between the spongy tapioca balls and the crunchy ice crystals along with their unique mulled wine and vanilla flavor contrast made for an interesting dessert that was as inventive and creative as it was pretty to look at. The orange blossom-poached fig slices added yet another layer of texture and flavor profile to the dessert. This completed what my husband thought was one of the best meals he’d had in a long time. 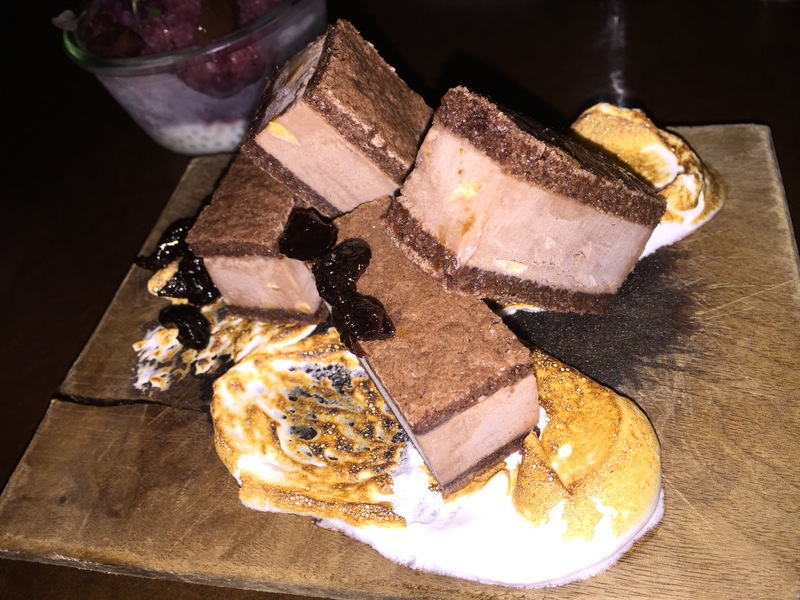 My choice for dessert was the double chocolate “ice cream” sandwich with burnt marshmallow meringue and sour cherries soaked in balsamic vinegar. The double chocolate ice cream sandwich was made with a chocolate cookie-brownie-like exterior encompassing rich chocolate ice cream to form a sandwich. This dessert was much larger that I thought it would be, definitely enough for 2 people with 4 ice cream sandwich pieces served atop a wooden serving board. The ice cream sandwiches are layered atop the burnt marshmallow meringue with some of the sour cherries soaked in balsamic spooned over the top. I didn’t think I would like the sour cherries at all, but the flavor of the balsamic vinegar it was soaked in was quite potent and removed most of the sour flavor from the sour cherries to the point where I actually thought that the flavor of the sour cherries wasn’t half bad. The star of the dish, for me, was the burnt marshmallow meringue. The marshmallow was soft and sticky, but wasn’t so elastic as to be true marshmallow. The texture was more like marshmallow fluff, which wasn’t too sweet and had such a terrific texture, the extra flavor from being burnt – probably torched – gives it that extra texture that helps to solidify the outside while keeping the inside marshmallow soft and fluffy. I was completely stuffed by the time I finished my dessert. First off, for being a Michelin-star restaurant with all of this acclaim and all of the awards they’ve won, I was amazed by how laid back the restaurant experience and how it almost felt like you were walking into your neighborhood restaurant rather than such a highly acclaimed restaurant. I think that’s a tribute to the owners and the set up to create a vibe that’s comfortable and inviting and welcoming. The concept of American fare served dim sum-style is so unique and different, but fun and engaging at the same time. 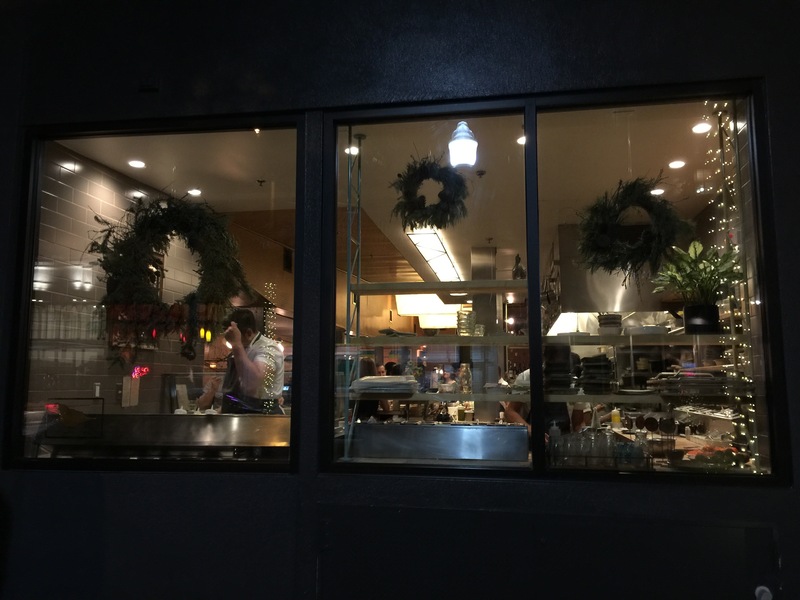 Another terrific appeal of State Bird Provisions is that it has got to be one of the most affordable Michelin star restaurant you will ever dine at, which also makes it more accessible to the public than most other Michelin star restaurants that are here in the United States. 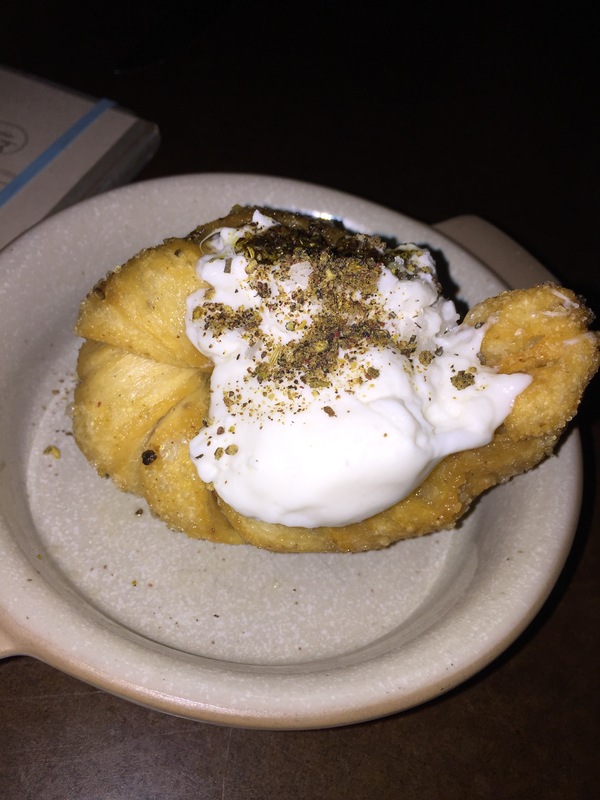 For months now after our visit to State Bird, my husband and I still talk about it, and we talk about the fact that we would go back to State Bird Provisions again a heartbeat if given the opportunity. The food, the atmosphere, the style of food, the service, everything about the restaurant is appealing and the for our vote, my husband and I think that State Bird lives up to its reputation and deserves all of the accolades it receives.